I said I’d do a review on my beloved Vicious, and welp HERE I AM, fulfilling my promise to myself that no one else cares about but THAT’S OKAY!!! If you’re reading this, I hope you’ll enjoy my ramblings about this novel. I couldn’t shut up about it in real life, so let’s take it to the digital screen. Let’s tell the tale of Sarah y Vicious. Brilliant, no? Brilliant, yes. Anyways, I perused the wonderful Sci-Fi & Fantasy section (as seen above with le Dragon) and I stumbled upon this slimmish novel, with a beautiful cover. The reds and blacks on it encompassed a mysteriously cloaked figure with white-blonde hair. My pal Taylor (who I recommended this book to and who totes LOVED it) said the figure reminded her of Malfoy. Which is legit, and probably another reason this book called to me. Sign me up for anything Half-Blood Prince era Malfoy-esque – I’m GAME. But okay, anyways, the book was staring at me, and I kept staring back. It was enigmatic and magnetic. And its name was VICIOUS. I picked it up, bought it, and didn’t look back. Basically, Victor Vale and Eliot “Eli” Cardale are 22-year old (the age I was when I read this WAHOO) seniors in college, ready to start their theses. What’s Eli’s thesis about? Extraordinaries. EOs. The people who have super-human capabilities that we mere mortals are yet to be able to comprehend. Victor’s ready to jump onto Eliot’s thesis-game (#same), pretty much abandoning his own. But Victor’s set to take it to a whole other level that Eliot hasn’t thought of – trying to become actual EOs. Their process of achieving said extraordinary levels is dark, dangerous, and pretty morbid. With lots of research and experimentation, and LOTS of moral ambiguity (!!! ), we follow along as the two best friends try to achieve what everyone else thinks is simply a myth. But all the while, the book flips from their senior year time period, and to a present day setting – 10 years later. In this present POV, Victor has just escaped prison and Eliot is now his worst enemy – somewhere loose in the world. With Victor desperately trying to find him. Who’s the villain and who’s the hero? And is there even a hero in this story? THESE QUESTIONS HAUNTED ME and made the book 100% amazing for me. If there’s one thing to know about moi, I am allll about Morally Ambiguous characters (GIVE DEM TO MEH). And Schwab DELIVERS them in this book (YASS). I definitely favor Victor over Eliot, but in the past setting (their 22-year old versions) I still had a liking for them both (Eli was attractive and it can’t be ignored). Each has a fight and a cause, and learning about it through their switching-year narratives made it all the more mysterious and intriguing. Plus, plenty of new characters and powers are sprinkled throughout the novel as it continues and goes on, and each one is fleshed out and fairly interesting. The only reason I won’t give this book a 5/5 is that the story gets SO good, but by the climax, the end pitfall is a just a little bit of a letdown. It is almost a cliffhanger of sorts, and well – there isn’t any sign of a new, second book coming anytime soon. And I NEED SOMETHING ELSE (BETTER) TO HAPPEN. But still, 4/5 stars for sure, because I couldn’t put this book down until I reached the gruesome and bloody end. I recently posted a photo onto Instagram of several books I’d purchased over the course of a few weeks. Which, consequently, means I haven’t read ANY of them – because I’m me. I’ve been watching WAY too many television series, and not picking up enough of my TBR books. Not putting down my beloved T.V. – just trying to balance the love. I’m always, always afraid of trying to appear like a “reader” (gotta keep up that English Major presence after all), and then find myself casually NOT reading. Ever. So in essence, be, not a reader. And if I feel like I’m not a reader, then that means I’m a FRAUD. Which makes me cringe and cry. 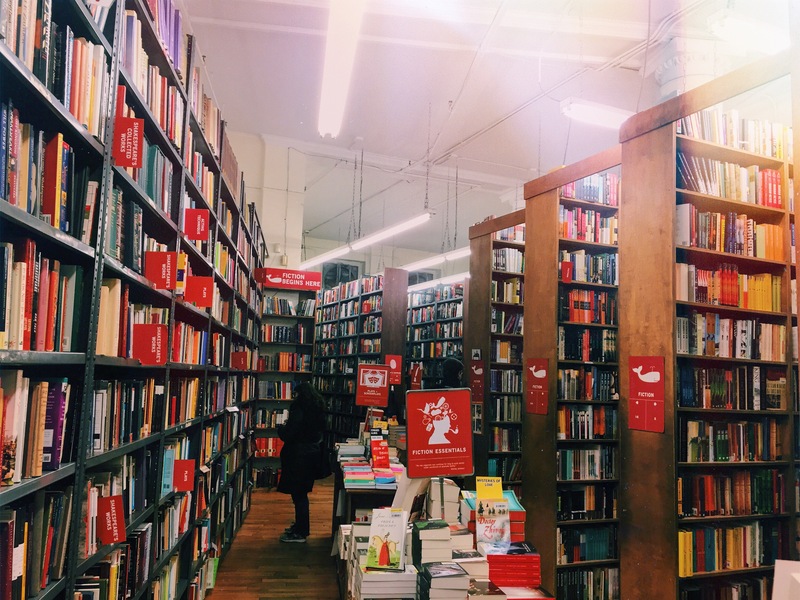 I don’t want to ever force reading (much like I don’t like forcing my writing), but I do want to take the steps it requires to get back into reading. Does this make sense? Oh well. Either way, here are the books I’m planning on diving into soon, and then I think – to motivate me – I’ll write some reviews about them up here after I finish them. HUZZAH! ^Said books. Below: pre-thoughts on books, and my estimated ratings. Because I am always a presumer. The Magicians by Lev Grossman: I first saw the ads for the SyFy show of this series a little while back, and obviously anything fantasy/featuring groups of youngish people (read: GUYS & GALS & CAMARADERIE) doing cool adventure-y stuff, has me hooked. Basically a bunch of people go to a “Magic” college (Hogwarts 2.0? ), which takes up half the book I believe, and then the rest of the story takes place after they graduate. A little bit near the age range I’m in right now, except sans Magic. Booooo. Pretty sure the show is V different from the books, but that kind of excites me, oddly enough. Going to try and finish at least the first book in the trilogy before I begin the T.V. series. Think I’m going to like this 4/5 stars. The Fifth Season by N.K. Jemisin: First of all, love the author’s last name? May have to steal that for a character one day HAH. But this one drew me in because the first words are basically: “So, the world has ended.” Like the whole first few pages are straight up casual, and dramatic and epic – yet so nicely written. I’m HERE for it. Seems emotional, def more adult than YA, and super-duper world building-y. I’m double-here for it. The premise it that there are four seasons (like our regular yearly seasons), but the fifth season is basically an apocalyptic one – so the world has to rebuild everything all over again when that happens. Kind of reminds me of how Pleakly had to explain to that Alien general lady in Lilo & Stitch that Earth has to start life all over again anytime an asteroid hits us. IDK it just made me think of that. Lady at B&N said to read this when you’re ready-to-throw-stuff-angry. I’M READY. 4/5 stars as well. 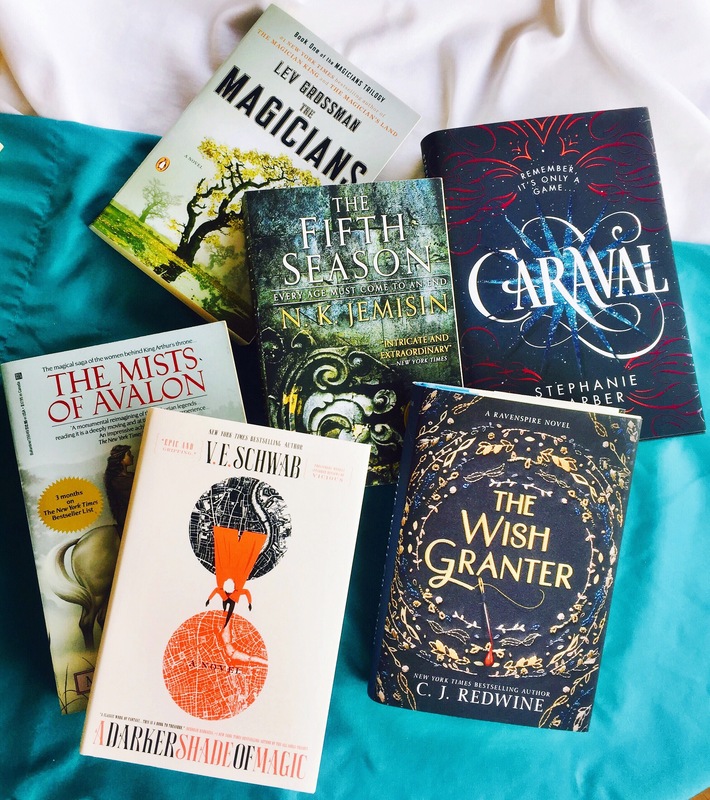 Caraval by Stephanie Garber: I’ve heard sooooo many mixed reviews about this book, so I hate going into it thinking I could definitely dislike it, but NOW MY MIND’S BEEN TAINTED BY THE BAD REVIEWS and there’s nothing I can do about it!!! But fear not – it’s just gotta be good enough so I’m not disappointed, right? And plenty of reviews say it’s good too. No pressure. It’s fine. Plus, I just can’t resist anything with a circus-ish theme/plot. This one seems more about a circus festival/game kind of thing, where the character has to compete in it. I’m going to say 3/5 stars. Because it’s gotta convince me. Again, NO PRESSURE heh. SO PRETTY, I HOPE YOU CRIED. Anyway, this one I impulsively bought without realizing it was the SECOND one in an ongoing series, but then learned that they can definitely be read interchangeably. 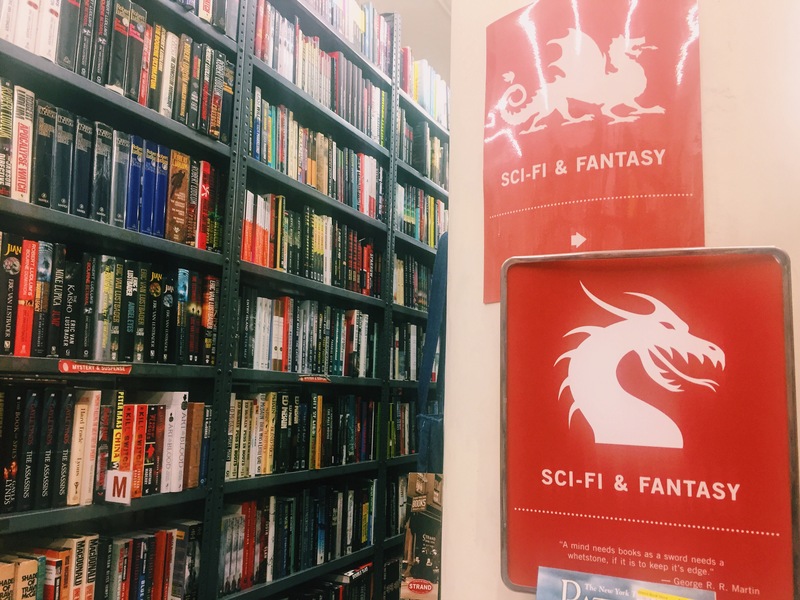 So like – same book-verse, different stories. 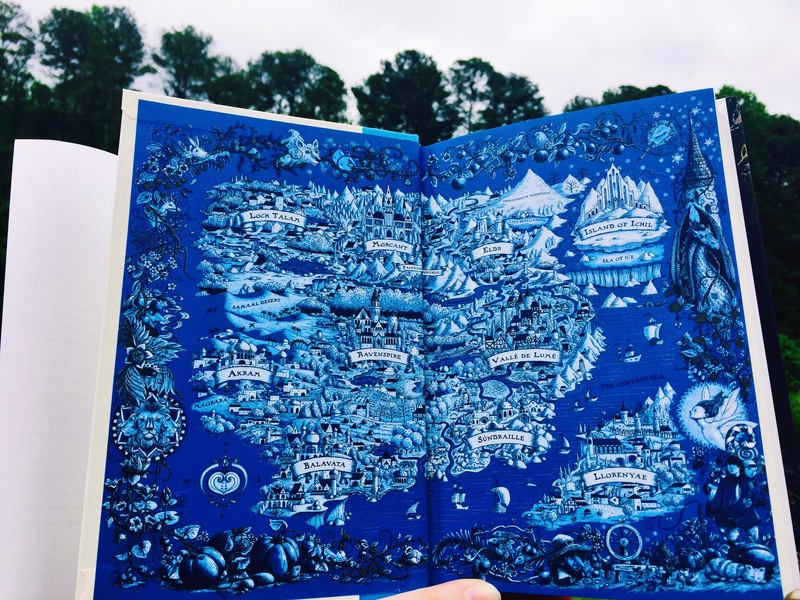 In fact, that gorgeous map shows all the different kingdoms the books take place in. SWOON. This one is about a pair of girl/boy twins who are illegitimate kids of the king, but when the king dies, the boy twin has to instantly become King himself. Or something like that, but tbh, will probably only know more once I start reading it (this is what happens when you impulse-buy and don’t even take the time to comprehend the premise). YA and fantasy, though the writing appears a bit simpler than others – so, 3/5 stars? We shall see. A Darker Shade of Magic by V.E. 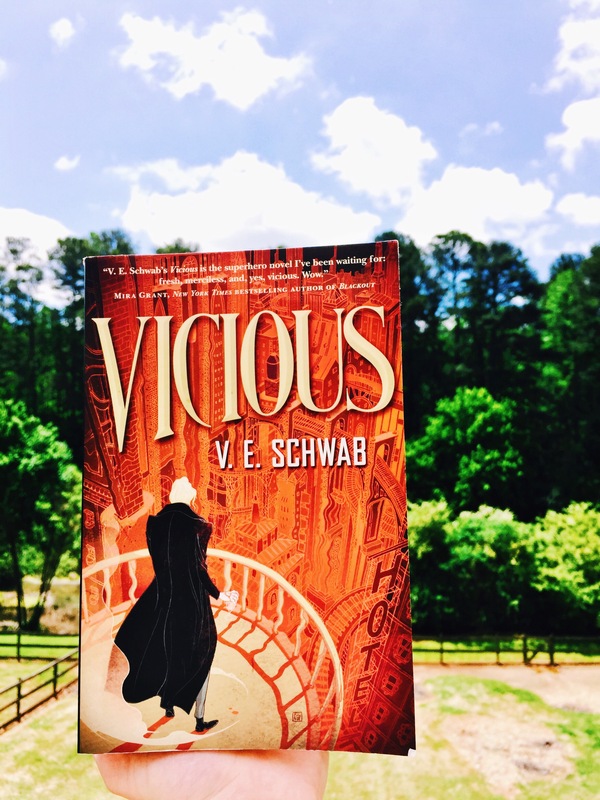 Schwab: So, I fell head over heels in love with how Schwab writes when I read her book VICIOUS – 4/5 stars on that one! May do a review for it – loved it, BUT the ending made me angry because I can’t handle cliffhangers when I have no idea when the next book comes out (or if there even will be a next book?? HELP). Anyways, great book, so I recommended it to my pal Taylor and then she got me the SECOND book in Schwab’s Shades of Magic trilogy for my bday (signed by Schwab herself! Omg she’s such good friend!! But don’t tell her I said that). So then I bought the beautiful first book in the trilogy so I can not just have the signed-second one on my shelf go unread for ages (though that could happen anyway…). Did anyone follow this exchange of events? I barely did, so I apologize. Anyways, this book takes place in London – or rather SEVERAL Londons! That’s right, multiple parallel universes and they all center around different L-towns. Can I say I am HERE for it again? Yes. I am HERE for it. Give me London, or give me death. Don’t know much about the plot (bad Sarah), but London + Schwab’s grade-A writing? Sign me up for all the books. And I’m going to go there…5/5 stars. I’m ready. The Mists of Avalon by Marion Zimmer Bradley: Again, love the author’s name? Like Hans Zimmer but not. Also, Bradley. Love that name. Sounds like Bradford. But not. For a moment there, I was like YOOO her name’s Marion, and this is a Robin Hood book, so how cool is that! But alas, tis not a Robin Hood book. But do not fret, this is a ARTHURIAN LEGEND BOOK! HECKS to the YAH. Just as exciting. Does anyone else ever get our Merry Men and our Knights of the Round Table stories confused? Me, me, I do. Probably because both are such epic British tales. Also, were the two namesakes in question pals on Once Upon A Time? IDK. Okay, but anyways, enough about the author name and Robin Hood glories – I picked this book (and its prequel, not pictured) up at my local library bookstore (what a beautiful joining of words). Again, I love everything Arthurian legend. I believe this one is told from Guinevere’s point of view, so you know – Shwwweeeeet. Perhaps, 3.5/5 stars – I’m intrigued with how much I’ll enjoy the writing or if I’ll get trudged down by descriptions – ever feel like you KNOW a book will be that way? I need to calm down with drastic presumptions. Okay, so Ready. Set. READ SARAHJ. YOU CAN DO THIS! I just wanna be loved. And by books most of all! 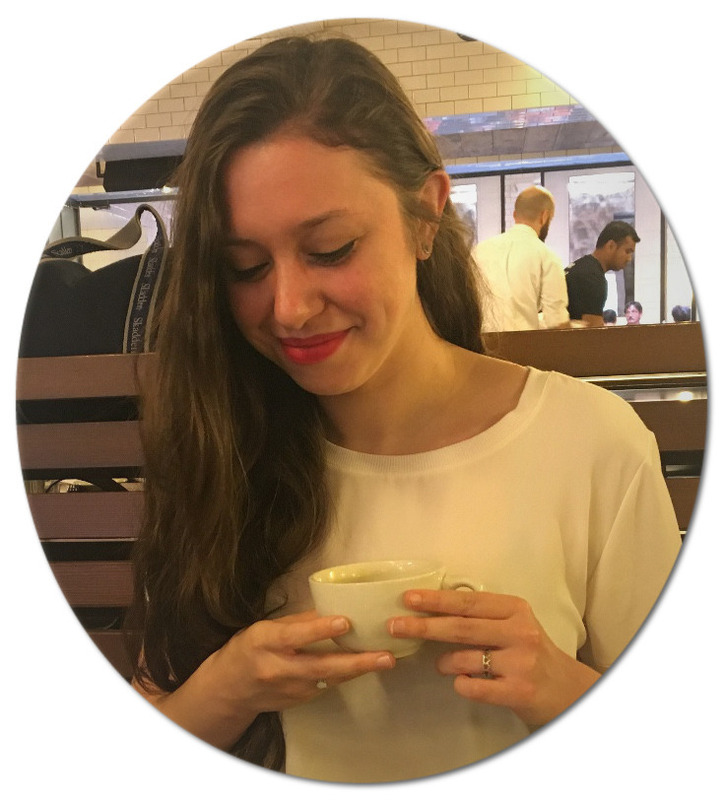 Hello lovelies, welcome to SarahjThoughts! You’ll find my various ramblings, dribbles, and *genius* insights galore here. I promise not all of my writing includes 100+ gifs (if only).